- Your machine size. What size diamond wheel will it accept? The six inch lapidary machine is the most common size. If you are interested in a grinding machine you can find them on our web site by clicking here. - The size of the arbor (shaft) on your machine. 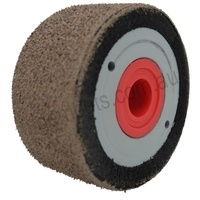 All of the lapidary grinding wheels come with a 1" shaft. 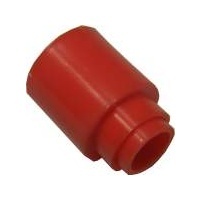 We supply a free plastic bush with each diamond grinding wheel that will fit most machines. If you are building your own machine make sure the shaft is "imperial" rather than "metric" in diameter as the bores and spacers are all manufactured in imperial sizes. - Hard wheels or Flexible Wheels? Generally it is best to do most of your preparation and shaping on a hard diamond wheel. 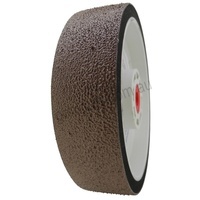 This is because they are long lasting and efficient with the diamond plated onto a steel rim. Once you have the shape of your stone it is best to finish it on a flexible wheel. 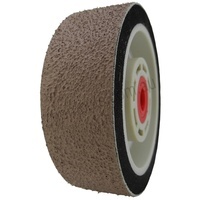 The flexible wheels are foam backed and have a slight drape that helps eliminates flat spots in the final polishing process. Some cutters prefer finishing on a 3000 grit or a 14,000 grit flexible wheel before going on to a final polish. 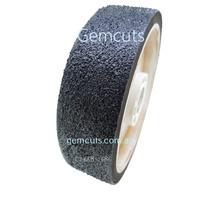 We don't recommend the 14,000 grit or finer wheels as they take a very long time to "break in". Until a wheel is broken in they tend to cause fine scratches. 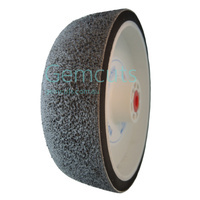 We stock two types of flexible diamond wheel that you can select from above. Both are made entirely in the USA. 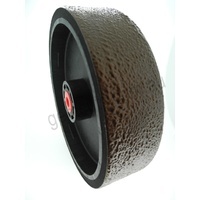 There are cheaper Chinese flexible wheels now appearing on the market but we don't sell or recommend them. We have found that they are not value for money and they lack quality, durability, balance and consistency in their application of grits.